About 80% of the input to our brain comes through our eyes. 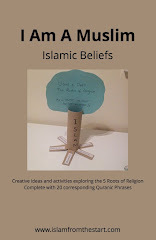 Parables are examples and analogies used in the Quran to help activate our imagination, the eye of the mind. They are usually told to illustrate a lesson and help us to understand and remember in a clear and easy way. Activity: Become familiar with some Quranic parables by reading selected verses and talking about what they could mean and reflecting on what they teach us.